A huge asteroid, thought lost until now, has been found heading back to Earth for a close flyby. The rock – known as 2010 WC9 – will skip past Earth at a distance half as close as the Moon. It is not only the closest flyby of this rock for 300 years, but one of the closest ever for an asteroid of this size. Asteroid 2010 WC9, as its name suggests, was first spotted in 2010. But scientists could only see it for about a month until it became too faint to see, and they were unable to get enough precise data to understand when it would return. That was until last week when the rock was seen again – heading back towards Earth. Initially, scientists were not sure whether the rock could pose a danger, but it has been removed from the list of possible impact risks and shouldn't hit the Earth for at least another 100 years. On the night of 15 May, it will complete its closest flyby: passing by at a distance of 126,419 miles. That should be bright enough to be seen with a small telescope, though it will not be visible to the eye. The rock itself is thought to be relatively small, though its size can only be estimated by using its brightness and distance. 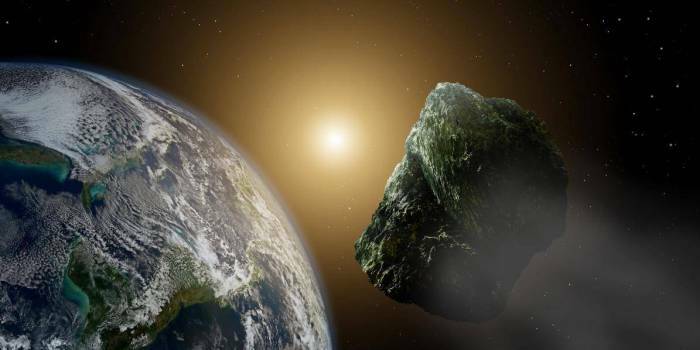 It is thought to be about 60-130 meters – larger than the famous Chelyabinsk meteor that fell to Earth and caused hundreds of people to seek medical attention.